The Yardstead - Farm Your Yard! We have chickens at the new Yardstead!! We have 4 Golden Comet hens. I went home to visit my dad and he insisted a take a few chickens from his new flock of baby chicks. The baby chicks were about 2 weeks old at the time. I brought four baby chicks home with me without telling Mary, and without any supplies. I wasn't sure how she would react but she was delighted. After a quick trip to a farm supply, and about $20 later, we had a waterer, a feeder, and some chick starter feed. 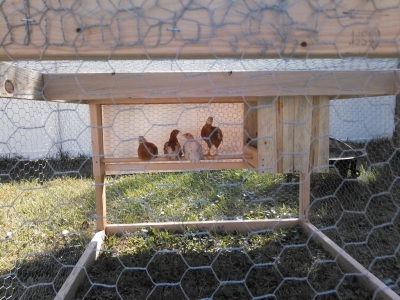 We kept them in a box for a few days, while I built them a small portable chicken coop. 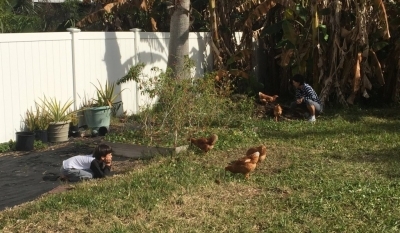 I have several pictures of the chickens and the preperations for the care of the chickens and the chicken coop, which is based on the "Chicken Tractor" principle and is portable. Check back soon or click the little bird and Follow us on Twitter for live updates. 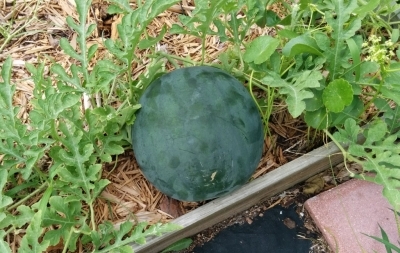 We have some nice Sugar Baby watermelons coming along in one of our garden beds. These are fairly small melons with a very sweet flavor. We have three plants which have completely filled in the 4 x 8 ft bed with vines. Each plant typically has 3 or melons growing at a time. These watermelons are a little smaller than a soccer bal when mature. I have one in the fridge now, for slicing later!! Well it's been quite a while since I posted anything! But now I'm back and ready to share my latest vegetable gardening experience with you. This spring I started a 4ft x 8ft raised bed, which I filled with assorted pepper plants. 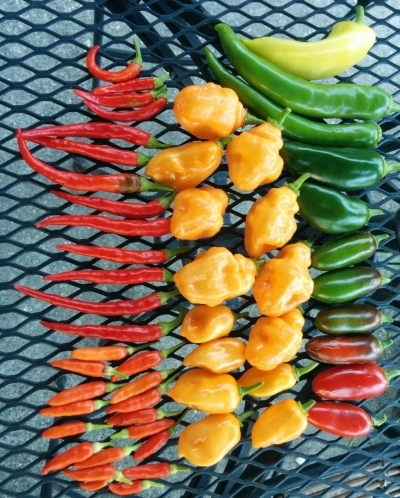 I have a lot of pictures from buidling the beds up to current pictures like the one above , with a daily harvest from the pepper patch. Currently in this 4ft x 8ft garden bed, I have one tabasco plant, three habanero plants, three jalapeno plants, one poblano plant, three banana pepper plants, three green bell peppers and one orange bell pepper plant. All of them are grwoing well and producing plenty of chillis. Over the next several days I hope to go back through setting up the beds, planting, and growing the peppers. I have a lot of pictures throughout the whole process. I will also provide some delicious recipes, such as for this Habanero Jelly I am eating at the moment wioth cream cheese and crackers. Stay tuned!! 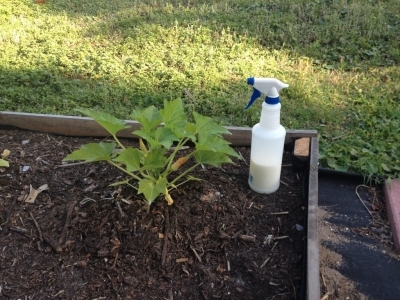 For the last couple of seasons, I've been using a solution of milk and water to treat powdery mildew on my squash, zucchini, cucumbers and mellons. Here is Jacksonville Beach, FL, the cucurbits seem to very vulnerable to powdery mildew. We have seen powdery mildew on some of our cucurbits every season. We try to raise and maintain our gardens without using chemicals, so I sought out a more natural way to fight the powdery mildew. I stumbled upon some research that shows a milk solution is effective for fighting powdery mildew. I use a generic 32oz spray bottle (pictured above) to apply the milk solution. I add 1/4 cup of milk to the bottle then fill with water. I usually spray all the squash if any of them are infected. I try to wet the leaves on the top and bottom. My experience has been, that if i catch the powdery mildew early, when the plants are still healthy but are showing white spots, treating them for 3 or 4 days in a row, usually clears up the mildew. When I start treating plants with milk after some of the leaves have withered and others leaves are yellowing or brown, the plants are less likely to survive, but some do. Early treatment, consistent over 3 or 4 days, seems to be the best solution for treating the powdery mildew.